We are experts in the design and production of high-quality, well-defined, ultra-pure poly(2-oxazoline)s (abbreviated as POZ, PAOx, POX or POXA). We have developed and patented a high-quality polymer production system. Our quality management system has been developed and implemented according to ISO 9001:2015 standard. In addition, we have built a strong IP portfolio protecting key polymer compositions (learn more). At AVROXA, we help you to develop new innovative products which best suit your needs by providing a scalable source of tailor-made polymers under the ULTROXA® brand name. We are a technology based company specialized in research and manufacturing of a vast range of ultra-defined unique poly(2-oxazoline)s for applications in therapeutics, drug formulation, nanomedicines, biomaterials and diagnostics. Beyond biomedicine, the unique versatility of the PAOx polymer platform enables its use in a wide range of areas spanning from cosmetics to smart materials. Share our passion! Learn more about poly(2-oxazoline)s and our technology. Poly(2-oxazoline)s provide innovative solutions in a wide range of applications. See some of the most promising applications based on this polymer platform. Discover the ULTROXA® product range. 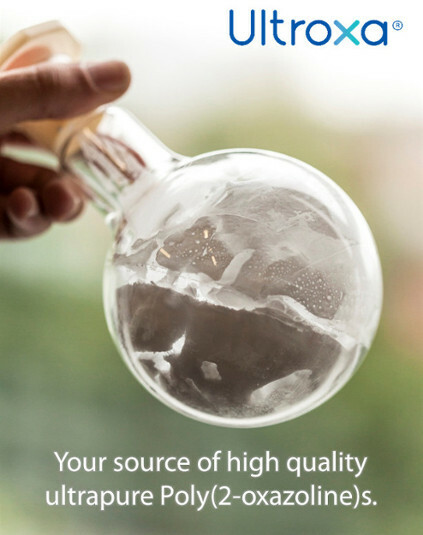 We also produce tailor-made polymers in quantities ranging from g to kg-scale. With over 30 years of combined experience in the field of poly(2-oxazoline)s and state-of-the-art equipment, we are the partner you are looking for! We have developed methods to produce defined PAOx (POx or POZ) with tunable physicochemical properties (from more hydrophilic than PEG via thermoresponsive to hydrophobic), tailored functionality, very narrow molar mass distribution (dispersity < 1.10), and high purity (> 95 %). Learn about our polymer technology. ULTROXA® Polymers provide innovative solutions in a wide range of applications. Discover the ULTROXA® product range. Stay up to date! Check our latest news and events.